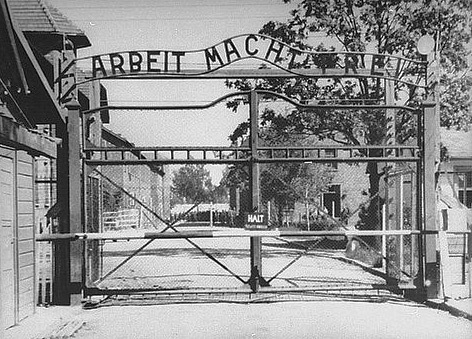 Early on Friday the famous "Arbeit Macht Frei" (Work Sets You Free) sign that hung over the entrance gate to the Auschwitz camp, was stolen. Commenting to the BBC on the theft of the Auschwitz sign, Rabbi Andrew Baker, the Director of the International Jewish Affairs of the rabid Zionist American Jewish Committee maintained that there should be no replicas to substitute the entrance monument. “There can be no copies or reproductions; visitors must see only what was real. In that way they will be bear witness to the very objects and structures which in turn remain the mute eyewitness to what happened there”. Rabbi Baker wants the “real thing”. However, every person who happens to be brave enough to step into the muddy topic known as Holocaust history, is quick to discover the embarrassing fact that lies at the heart of the Auschwitz museum experience: the gas chamber on display is no less than a reconstruction built after the war by the soviets. The original gas chambers were destroyed by the Germans in October 1944 just before their evacuation. Here is an attempt by, again, another ultra kosher Zionist memorial site to deal with the fact that Auschwitz Crematorium 1 is a reconstruction. Some historians debate as to the original function of the ruined gas chambers. I would save myself from commenting on the subject. First, I am not a historian. Second, I am far more concerned by the systematic destruction of the Palestinian people by those who survived the Holocaust. This continuous shoa that is curried out by the Israelis, in the name of Jewish suffering, is taking place right in front of our eyes. Yet, one thing is clear beyond doubt. For the last six decades tourists have been visiting a gas chamber that was built after the war by the Soviets. As far as the Auschwitz museum is concerned, people haven’t been witnessing the ‘real thing’. Accordingly, I would advise Rabbi Baker to revise his demand. The Auschwitz Museum experience is founded on a “copy” and a “replica” or in other words “a restored space meant to be a memorial and symbolic representation”. For the last three decades Auschwitz has been operating as a tourist resort. It has its Holiday Tourist Guide, ‘near by’ hotels, Hot Dog stand, recommended restaurants and so on. Considering Auschwitz has achieved the status of a successful tourist attraction, I would regard the theft of the entrance monument as a major opportunity. I suggest the current staff at Auschwitz prepare for a mass of tourists to come. I propose creating many more gate facilities decorated with entrance monuments. In the spirit of multiculturalism and global markets, each entrance can be accompanied by a real McDonalds for the American crowd, a genuine pub for the Brits, an authentic Nandos for chicken lovers and Maoz Falafel for the Israeli youngsters who are sent year after year to brew in Jewish suffering just before they join the IDF. It is in Auschwitz where young Israelis fuel themselves with enough hatred so they can punish the Palestinians for crimes committed by Europeans.